First of all, let me say that that cover is great - a POV of a fatal zombie attack with a kind of pink hue makes for one of the more interesting covers of the year so far. I like what Adlard does with his covers, and the way he uses a dominant background colour to denote something or other (like with the reds of the 'No-one is safe' arc. So issue 51 finally comes around, 6 weeks after the 'standalone' issue 50, which was all about Carl. This issue is more balanced, with Carl still getting a chance to develop as a character (and Kirkman gets to put an educational message across about the joy of reading). You get the sense more and more now that this is a child who is having to grow up fast, but for all his steely resolve and pragmatism, the child in him still manifests itself on occasional moments that are touching and real. Out in the world beyond their current bolt-hole, there is a zombie attack (hence the cover). I'll say no more on that. It works, it sums up the desperation and lack of hope in a disturbing, horrific way. This is another issue where you could say that nothing much happens, but I would argue that this issue may prove significant in determining the futures of both Rick and Carl. Is Ricks grief at the death of his wife and infant child going to take its toll? Is the hopelessness of their situation finally weighing him down? I hate to make comparisons but when I am reading through this issue I cannot help but think of 'The Road' by Cormac McCarthy - the strong bond between father and son, the massive importance on the basics of life (food, shelter) and the tangible feeling that the burden of responsibility on the father may ultimately prove too much, mentally and physically. 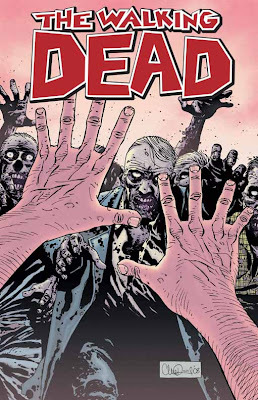 I don't care what happens next issue - I trust Robert Kirkman and Charlie Adlard to deliver. It looks as if someone from the recent past may show up, and that may be the beginning of a new chapter in Rick and Carl's life. If that is the case, then this brief glimpse into the father and son dynamics, played out since the end of the 'no-one is safe' arc, has to be cherished as a change of pace and scripting that worked beautifully.